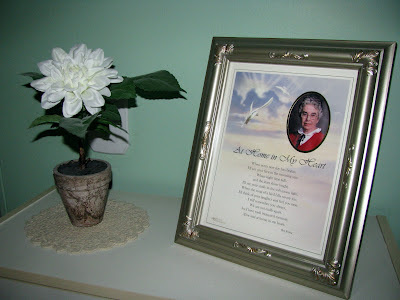 The white flower pictured above was the last Mother's Day gift I gave my Mom. It was around this time last year when I was in Nova Scotia to be with her as she recovered from her surgery to have a brain tumor removed. But, it was too big, too late, and my Mom passed away this past January. I remember wanting to buy her really flowers, but wasn't able, as she was on the "brain floor", which was scent free. I will eventually place this flower by her grave on a trip to Nova Scotia, but I'm not ready yet. It's placed in a spot in my home where I see it every day. It reminds me not only of my Mom, but of the time we spent together after her surgery. The surgery and medication gave me my Mom back for a little while and being able to sit, talk and laugh with her again was a gift. I appreciate Mother's Day more this year then any other and I know the best gift cannot be bought in a store or even held, because it's time. Time spent with the ones you love is the best gift, and I know I will always long for a little more of it with my Mom.